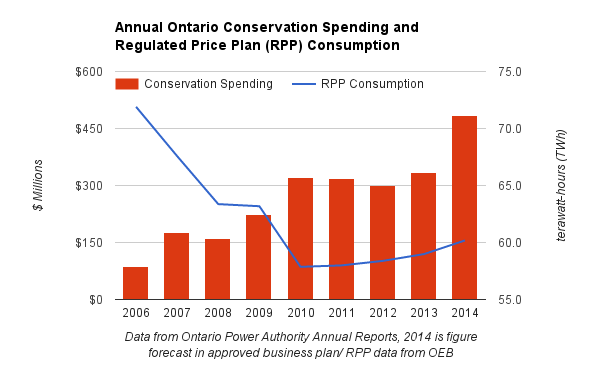 There is a danger in the report's implication the Ontario Energy Board should include massive conservation program spending in fixed distribution charges going forward - without any type of cost-benefit analyses because, ya' know, conservation culture - but what you really need is a reason to avoid reading the report. The Green Button Initiative was developed in the United States and copied here after billions of dollars in spending with any intelligent spending on data mapping. Not that it's seeing much use, just that nothing says insular gang like taking credit for the output of a pet project of the President of the United States. Perhaps the Smart Grid Forum is just a marketing thing to spread work around Toronto's green community. That certainly seemed to be the case when it became apparent the writing of a previous report was contracted out weeks after e-mails showed a government operative was keen to find work to reward the contracted writer. In fairness, that report was far better written... and shorter. Celine Bak seems to be an intelligent woman, and that seemliness allows her to argue silly positions. The government should have worked harder at emphasizing the value of eliminating coal-fired power production, she said, and also designed the system to ensure there was more community involvement in clean power projects. When Nanticoke stopped generating power from coal at the end of 2013, the Ontario Power Authority reported 2486.5 MWe of wind in service, 1018.7 of solar, and 111.6 of bioenergy. That is just 1/3rd of the government's plan for 10,700 on non-hydro renewables. The Green Energy Act and Feed-In Tariff plan are unrelated to the elimination of coal in the province - and I disagree with the proposition proponents of junk generation should lie about that. The type of jobs John Candy's character described many years ago - for "doctors like you and surgeons like me"- now for engineers like you and scientists like me. Here's new damage from the high energy back rooms of Toronto. The Ontario government this week stupidly issued a Renewable Energy Approval for the "White Pines" wind project. Stupidly in large part because the Feed-In Tariff contract for the project was announced over 5 years ago, in April 2010. Those contracts were at a rich $135 per megawatt-hour in part to get them implement rapidly (within 3 years) and in part to build supply chains within Ontario (obviously in contravention of world trade agreements as has long since been ruled by the relevant trade organization). At a 30% capacity factor the project will cost rate payers over $21 million a year and $426 million over a 20-year contract term - rate payers already bearing a huge burden of record high net exports at record low rates due to the frequent dumping of supply. It's almost unimaginable that the stale-dated FIT offer is not twice as much as power competitively tendered today would cost - and wind power is the least valued generation in Ontario, and everywhere else there's a market to measure value. And, it's not about replacing coal. I also noted this week the save on energy campaign encouraging the use of propane, adding lights outdoors, and tips for improving the back yard pool experience. Some of the advice was simply bad, at least for people avoiding gas use. Back in the day, when I had a pool, I wasn't into couponing, but I was into lowering bills. Here's a tip that is exactly the opposite of the IESO's gassy, "Install a heavy-duty outdoor timer on your pool pump, then program it to come on for just six hours per day, in the early morning or late at night to avoid peak hours." Get a solar blanket and only run your pump in the heart of the day when it's sunny. Sure it will cost more (only on weekdays), but you'll recirculate warmer water from the top of the pool instead of recirculating the cooler water from cooler nights. As the IESO sees fit to concentrate on people with outdoor cooking areas that could benefit from state-of-the-art lighting and expert advice on pool pumps, I'm going to point out something I've avoided previously - the enormous pay at an organization that doesn't generate or transmit electricity. 4 of the top 40 on 2014's Sunshine list worked at the IESO, a number I suspect will rise in 2015 after absorbing the more modestly paid Ontario Power Authority. That seems high for a market operator that has no participants exposed to market pricing, has never recovered less of the cost of supply than it currently does, and currently acquires more excess generation to dump on external markets than ever before. Maybe a more diverse executive team would find bigger priorities for newsers than pool parties. The final global adjustment figures for June were released on the 15th, and were again huge- so big I decided to glance at the Ontario Energy Board's (OEB) Regulated Price Plan (RPP) Variance Settlement Account. Briefly, RPP consumers should end up paying, on average, the market rate (HOEP) plus a global adjustment charge (class B GA); HOEP + Class B GA has been far above RPP rates for the past 3 months, and the variance account has, as I expected, been shrinking by about $60 per month over that period. If this continues the next RPP rate period will have higher rates due to the changed position of the variance account. After a 5-year decline in consumption from 2005-2010, it's held steady in recent years. 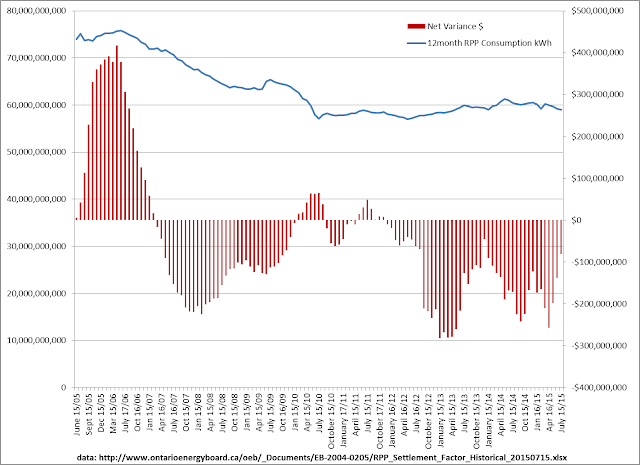 There could be reasons for that aside from consumption - like consumers switching into the regulated price plan from wholesale rates, but it is an indication recent conservation programs aren't as successful as previous ones - or nones! Must be lots of people still not right-sizing their pool pumps.